Imagine that the only thing keeping you from becoming a parent is writing your adoption profile. Sounds pretty simple. Just sit down and start writing it, right? But that’s when things get complicated. For starters, you don’t know anything about the expectant mother you’re writing to — who she is or what she’s looking for. You could make assumptions and write about what you think she’s looking for. But that won’t get you very far. You could be right. But more often than not, you’ll likely be wrong. The only thing you can do: Just be yourself and write about the things you would want to know if you were in her shoes. These may seem like mundane details to you, but don’t write them off. Many expectant mothers are looking for a couple in a specific location that have been together for a while. It’s these specific, concrete details that help create a portrait of yourself and set you apart from other waiting parents. You’ll need to get to this topic eventually so why not do it at the beginning of her letter, while you still have your reader’s attention? Don’t be like other prospective adoptive parents and wait until the end. She may not get that far. As with everything else you say in your profile, make sure that it’s accurate, honest, relevant and useful. If you have a link to adoption, either through a family member or a friend, don’t shy away from talking about it. Most expectant mothers won’t know a lot about the topic and so anything you say could help normalize the situation and give your words credibility. How would you describe yourself to someone you’ve never met? How would others describe you? What’s unique about you or differentiates you from everyone else? Try to find the colour and details that will make you stand out. They don’t have to be extraordinary. They just has to be honest and authentic. If you have a partner, describe how you first met. What stood out and grabbed your attention? Again, be specific. How you met — whether it was online, through a book club or while playing a game of Ultimate — say different things about you. Also, talking about your partner is a great way to give an expectant mother an unfiltered glimpse into who you are and show your love for each other. What do you like to do in your spare time? What are you passionate about? Don’t write about what you think she’s looking for. Your letter isn’t the be-all and end-all of your relationship. It’s just step one. And one day the wrong words could come back to haunt you. What are your parents like? How many siblings do you have? Do they have children, and if so, will they be close in age to the newest member of your family? Have you told your family about your adoption plan and if so, how do they feel about it? What are some of the things you did when you were growing up? What lessons did you learn from them? If you have photos of a holiday or family get-together, be sure to share them in your profile. Many expectant parents have grown up with pets, and want their child to grow up with one as well. So if you have a pet, don’t forget to mention it. You would be surprised at how many expectant parents connect with this part of a profile. What values and beliefs were you raised with? What did they teach you and are you planning to pass them on to your children? Is there an event in your life that changed the way you look at the world — something that offers an insight into your personality and the kind of person you are today? A setback or challenge that you fought back from, or a person that influenced you? Tap into the emotional centre. Stories are sticky. Facts aren’t. Talk about a recent place you visited. Why did you go there and what did you do? Whether it’s a trek through the rockies or relaxing on a beach, your vacations speak volumes about you. What’s a typical day or weekend like? You don’t have to go into the minute-by-minute details, but give a sense of what she can expect. Be realistic and don’t oversell yourselves. If you go overboard with this part of your profile, she may start questioning the rest of it. Expectant mothers don’t care how big or fancy your home is. But she will be curious to see what it’s like. If you’ve prepared a nursery, include a picture of it. It will show her how committed you are to your plan. If you have a nice open backyard that’s just waiting for a child, include a picture of it too. Describe your neighbourhood. Is it quiet or buzzing with activity? How diverse is it? Are there lots of children around or parks or other places where kids can play? What are your neighbours like? If you already have a child, describe some of the things you like to do together. If you don’t, talk about your experiences. Whether it’s babysitting your nephew or making cookies with your friend’s children, try to include as many photos as you can. What do you think makes a good parent? What kind of parent do you think — or hope! — you’ll be? What do you believe is important? What kind of values do you plan to raise your children with? Education is a game-changer for many expectant mothers. One of the reasons they’ve created an adoption plan is to give their child opportunities that they can’t provide. So don’t neglect to mention your plans. And while you’re at it, be sure to talk about your own education and how it shaped your life and the person that your are today. 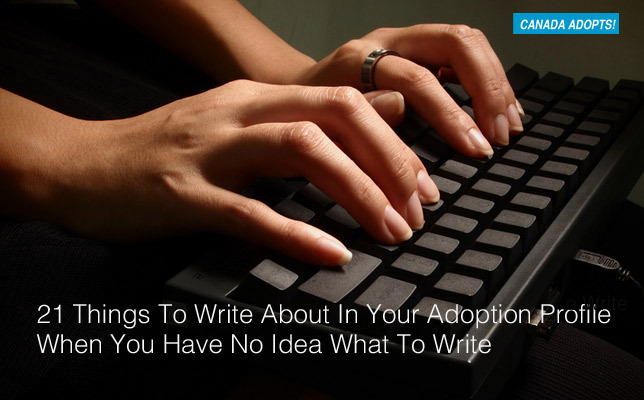 You’ve talked about why you’re adopting in the earlier section of your letter, now it’s time to get into the details. What appeals to you the most about open adoption? What do you know about it? Why have you chosen it? What do you hope that you and your child will get out of it? It’s not enough to describe your post-adoption plans. An expectant mother wants to know where she will fit into them. ou likely won’t have all the details nailed down now, but since most expectant parents want some level of post-placement contact it’s important to get the conversation started, and your profile is the perfect place to do it. It’s hard to know what an expectant mother is looking for before you speak to her. As a result, you need to avoid making assumptions about her and tailor your writing to what you think she wants to hear. Instead, focus on creating an honest and accurate portrait — one that answers her questions and shows her what kind of parent you would be.